Personal bests: Triple Jump-51'3", Long Jump-22'9"
Favorite quote: "Where you are tomorrow begins with what you do today." 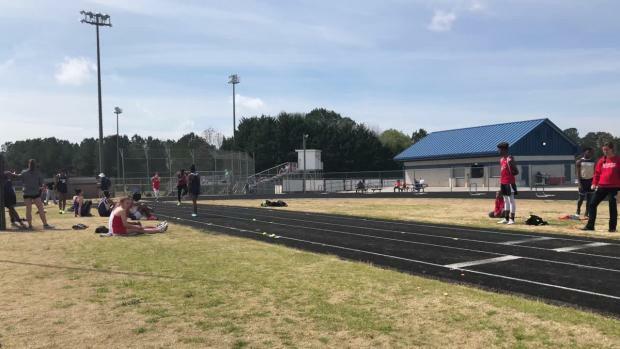 I got into the sport initially because my father was a great track athlete and I thought it would be cool to do the same thing that my father did. 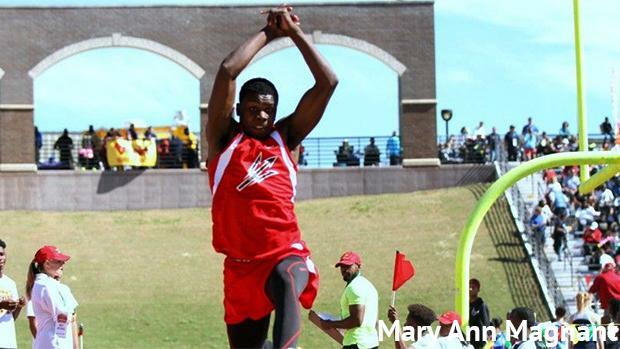 Tell us about your triple jump this past weekend (at time of interview)? What does it mean to perform how you did? It means a tremendous deal. It's just a testimate to staying dedicated to not only to my training but to God. I'm an extremely blessed individual and though I work hard, it's God behind all of my success. 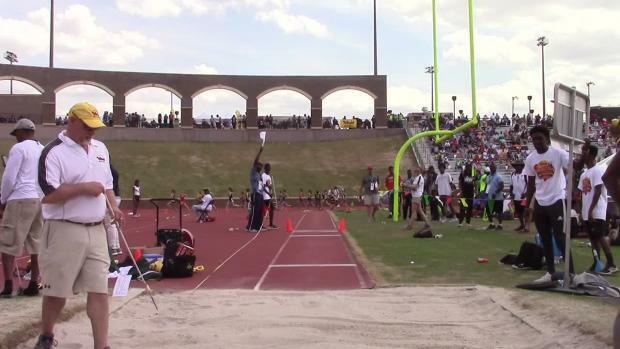 My triple jump this past weekend was a great jump, but I'm not that happy with it. I know I can jump further, so i'm going to keep working to reach that goal. Please walk us through the event. It is an extremely technical event. You essentially jump twice off of one leg and for the last jump you switch to your opposite leg. From your success in 2017, what do you hope to do this season? I hope to do big things this season. 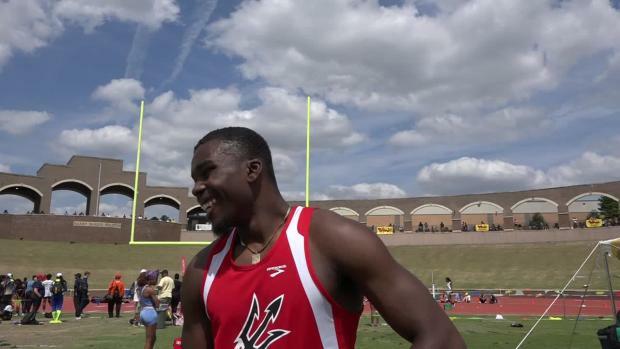 I want to break the state record and also continue to be the top triple jumper in the nation. I have many sources of motivation. In the beginning it was mainly my family and I, because I'm a pretty self driven person. Once I started getting better, I got more and more community recognition and it was then that I realized that what I was doing was bigger than myself and my family. My community gives me so much support so now I draw motivation from them as well. One of my biggest challenges I have with this sport is my mentality. I constantly think that my jumps can be improved upon and that i'm not performing at the level that I should be on. It works to my advantage because it allows me to push myself and not get complacent but it also sets me back sometimes. One year after this season left at the high school level, what do you hope to achieve in the future? I hope to make it to the NCAA championships my freshman year and to be an immediate impact on my team both with my jumping but also with team chemistry and morale. Tell us about signing with Stanford. What was part of the decision? How was the recruiting experience? - Being recruited and going on the official visits were the best times of my life. It was an amazing experience that I wouldn't trade for anything. One thing that I crave is personal growth and exposing myself to different cultures, ways of thinking, and walks of life and that is one thing that Stanford offered that the other schools couldn't. It is an amazing school, gifted in both academics and athletics and I feel like Stanford soil is where I can really plant my roots and grow not only as an athlete but as a student and as a person. What would you recommend to others about recruiting? One thing that I recommend is having a good support system behind you and to consult with someone you trust. It is very easy to be swept away with the facilities, the campuses, and the promises but at the end of the day you have to do what's best for you and your future. Schools may treat you like royalty on your visits but you have to be able to see through the veil and realize that if that's the school you attend they may not treat you that way, so you have to be happy with the college itself and the people that it comes with. I wish to win the big invitationals and continue to improve my marks and my strength. Walk us through an event for you (from pre race until post race). For me when I have a big meet or am trying to produce a big jump, it consumes my thoughts days before the event begins. Despite this however, I try not to think about it the day of the event to prevent over thinking and it really allows me to trust myself and my training. I warm up and I take the warm up serious but I talk with people, joke with people and I just have fun overall. Once I step on the runway however it's complete seriousness and I block out everything thats going on around me. Once i'm finished with my jumps I continue to joke and talk with my friends and I just enjoy the meet. To be completely honest close to nothing. When I step on the runway I block everything out and I concentrate on my phases but besides that my mind is clear and focused. I prefer triple jump over long jump just because I think it's a lot more fun than long jump. Jumping three times is a lot better than jumping just once. I play basketball and It helps to keep my legs firing during the off season. Track is a great compliment to any sport just because it improves your raw athleticism. It gets you faster, stronger, and more explosive which helps improve many aspects of many other sports. How do you look at being top-ranked in the state and near top in nation? It's nice to think about, it's another fruit of your labor but at the end of the day you can't let it satisfy you. It's always important to keep working and to always improve yourself no matter how you stack up compared to other people. I started getting back into the rhythm in February. I tried to train and jump a few times in January but since basketball is so demanding those jump/training sessions were few and far between in January. February was when I really got to pick up my training and really work on my craft. What do you enjoy the most about the Liberty team? How supportive we are of each other. We may be a small team but we truly care about others and getting each other better and I really cherish that. The importance of support. You are only as strong as your weakest link so i've really learned the importance of pushing each other and helping out teammates in times of need. If there was anything I could do in the world, it would be to end gun violence. The millions that are affected by gun violence live with a very real fear of sending their children to school or work, or even going to these institutions themselves. No American should be in constant fear for their life, and that is exactly what has happened to our mothers, daughter, sons, fathers, etc. Gun violence is an active terrorist in our society and ridding of such violence and trauma is something that I would do in a heartbeat.